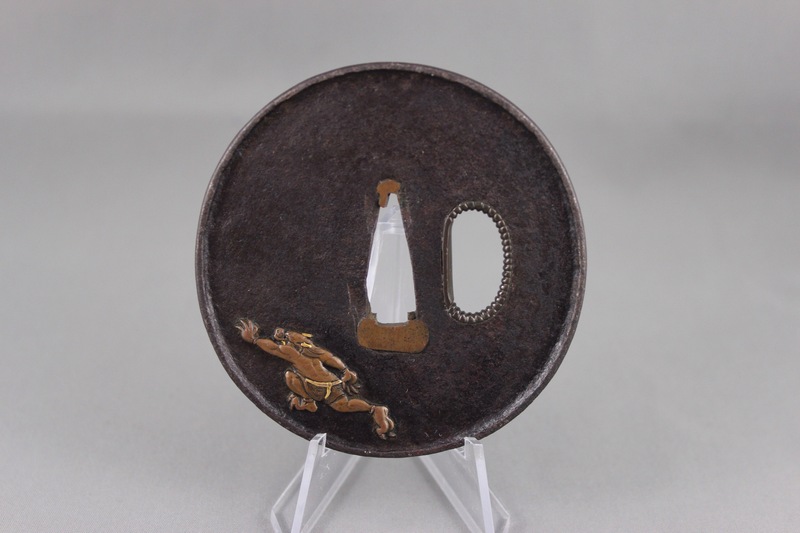 Round iron plate with hammered raised rim. The face with high relief inlay of Shoki “the Demon Queller” in iron, gold, copper, and silver, with very fine detail carving. The kozuka hitsu is outlined with a bead form shakudo liner and shakudo pillow. 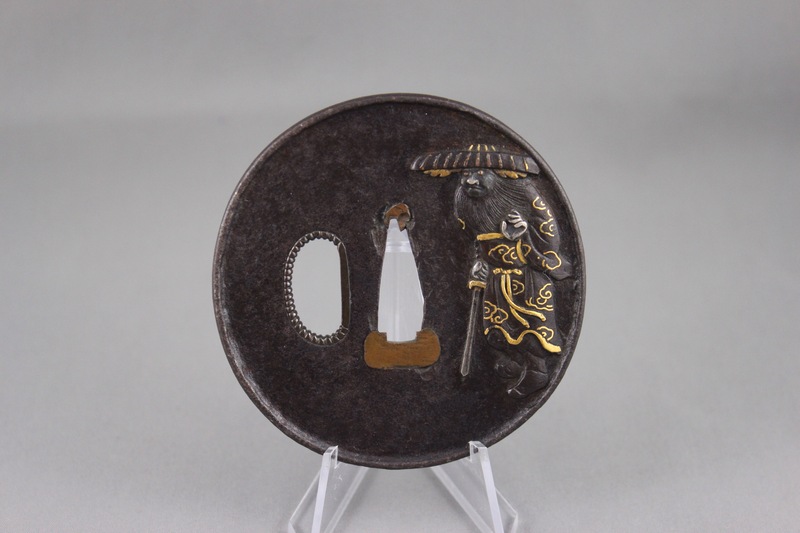 The reverse with high relief inlay of an Oni (Demon), running from Shoki, in copper and gold. The plate is signed: ‘Tadatsugu’ H 09190.0. See Kokubo Kenichi: SHINSEN KINKO MEIKAN, Tokyo 1993, page 181, lower center for this signature. SHOKI – The Demon queller, a conspicuous figure in Japanese art. This legendary character dates back to the Chinese Tang dynasty (618-906 A.D.). He is said to have been a ghostly guardian of the Emperor Genso, to whom he revealed his history in a dream. He had been a student during the reign of Kan no Koso, but had failed at the imperial examination, and sooner than live without a degree, he had committed suicide. The Emperor Genso gave orders that he should be buried with high honors, and in gratitude his spirit had vowed to remain forever engaged in the expulsion of demons from China. The Chinese represent him as a ragged old man accompanied by a bat, symbolical of happiness, but the Japanese depict him in a martial gard with a naked sword, hunting down demons (Oni). Shoki is usually represented with a flowing beard, and sometimes is shown riding upon a Korean lion. ONI – Generic name for devils, the representation of which in art is quite a common feature. Onis have claws, a square head with two horns, sharp teeth, and malignant eyes surmounted by big eyebrows; occasionally they wear trousers of tiger’s skin. Oni are depicted hiding in all sorts of strange places – in wells, under Shoki’s own hat, behind him, in boxes, etc., or running away as fast as their legs can carry them.